The earliest records in our collection relating to the French are contained in the Colonial Secretary's Papers, 1788-1825. Included are letters that relate to a number of French vessels visiting Sydney, such as the Surprize asking for permission to go sealing in 1802 [4/1719 pp.128-30] Reel 6041. Other references include a request from Louis Claude de Saulces de Freycinet to make a hydrographic plan of the “roadstead” at Sydney Harbour in 1819 [4/1743 pp.151-52] Reel 6048. A Frenchman who played an important role in the development of commerce and banking in the colony was Prosper de Mestre. He was the second person to be denized in September 1825 and there are numerous references to his business activities in the Colonial Secretary’s Papers. There were only small numbers of French-born convicts transported to New South Wales. Well-known examples include James Larra and Francois Girard. Larra, a French Jew, arrived with the Second Fleet on the Scarborough and was granted the first liquor licence in Parramatta in 1798 [SZ766] Reel 655. Girard was transported on the Agamemnon in 1820 and received a conditional pardon in 1825 [4/4431] Reel 774. He is supposed ot have influenced the naming of Napoleon Street, Darling Harbour is supposedly named after him. Lesser known examples include seaman Francois Fieudard, a native of Toulon, who was tried in Cornwall and transported on the Admiral Gambier in 1809 [4/4430 p.135] Reel 774. In 1840 the Buffalo arrived in Sydney with 58 French convicts from Lower Canada. These prisoners were interned near present-day Concord, resulting in the naming of French Bay, Canada Bay and Exile Bay. Many of these convicts appear in the series Butts of tickets of private employment, 1841-42, NRS 12199 [4/4287-88] COD 214 and Reel 592 and indexes to ticket of leave passports. A list of free pardons for all but six of the convicts is at 44/5586 [4/2641]. Most of the convicts returned home to Canada when their sentence was completed. France used New Caledonia as a penal colony from 1864. This caused some alarm among the governments of the Australian colonies who sought reassurances from the French that preventative measures were in place to prevent escaped convicts and pardoned convicts from reaching Australia. The convicts are also referred to as Communist exiles. Colonial Secretary, Main series of letters received, NRS 905: List of former French convicts from New Caledonia residing in NSW, 1885 [4/887.1]. Colonial Secretary’s Special bundles, NRS 906: 1874-90 Correspondence to Governor, including French Communist exiles from New Caledonia etc. Includes a report on Henri Rochefort, one of the most prominent Paris commune leaders. Clerk of the Peace, Extradition cases, 1881-1905, NRS 834. Includes depositions, warrants and other papers relating to the extradition of persons “illegally at large” from New Caledonia. A list of cases is available. 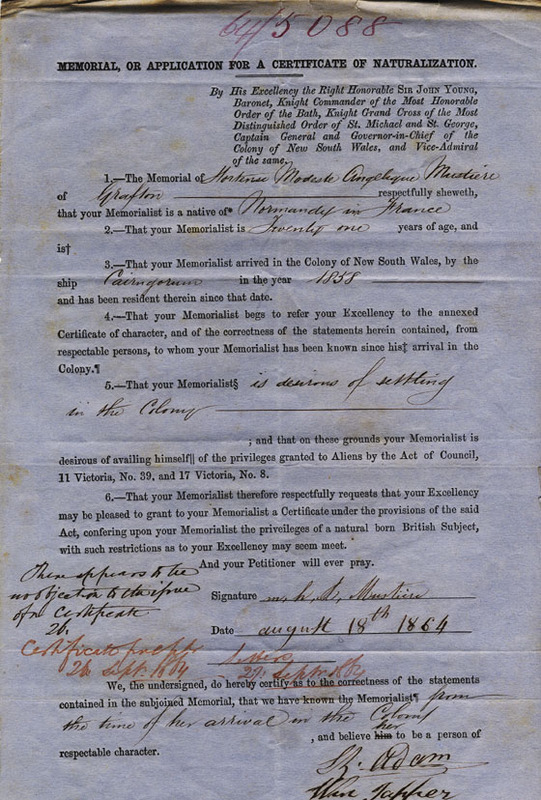 NRS 906 Municipalities, Petitions and Counter Petitions for incorporation, proclamations, by-laws etc 1859-74– Hunters Hill [4/729.1, 4/734, 4/794]. Includes names on petitions and letters from the likes of Jules Joubert, Didier Numa Joubert, Charles Edward Jeaneret and Gabriel de Milhau. The Hunters Hill region was known as the French Village during the 1850s. NRS 906 Returns of patients of French Nationality in hospitals and asylums c. 1867-72 Letter No. 72/9747 [1/2193]. NRS 906 Translations of communications from French Consul, 1881 [4/834.3]. Includes information on French nationals living in and visiting New South Wales. NRS 906 Detention and opening of Pasteur correspondence, 1888-89 [4/887.3]. Includes copies of telegrams from M. Pasteur to two French scientists, Drs Germont and Loir, who were conducting experiments for the Rabbit Commission. Arthur Dubois came to New South Wales from Bordeaux in France in about 1857 at the age of 18. He spent his time in NSW working on the land, mostly in the New England region down to Condobolin. In 1868 he married Caroline E Wood in Murrurundi (BDM 2820/1868) and after her death in 1884 Arthur married again in 1891 to Mary Agnes or Minnie Aisbett in Tamworth (BDM 7528/1891). He seems to have had at least twelve children. He died in 1902 in Condobolin. It appears Arthur and John Clifford were found in possession of some 100 odd sheep that were missing from the neighbouring property of Francis and Michael Cunningham. The C tar brand had been over stamped with a DL fire brand and some of the sheep had been slaughtered. Dubois was found guilty because the sheep were on his property while Clifford claimed to be minding the sheep for Dubois. The time spent in prison does not seem to have held Arthur Dubois back. Upon his release he returned to his family in the Tamworth/Condobolin region where he carried on farming. Upon his death in 1902 Arthur had become a grazier, owning large plots of land in the Condobolin region. In his will Arthur leaves everything to his wife, Minnie. (NRS 13660 Probate 4/26632) The deceased estate file provides a breakdown of Arthur’s personal effects, including over 5000 acres of conditionally purchased lands and some freehold land, along with a large mortgage to the Bank of New South Wales. He ran over 900 head of sheep and a few cattle and horses. (NRS 13340 Duty Paid 22/10/1902) The land included improved and unimproved allotments, one containing a nine roomed weatherboard house with kitchen and wash house, detached stable and loft and coach house with tack room. Naturalization Application for Hortense Musti from Normandy, 1864. She settled in the Grafton region and married a fellow Frenchman, Francois Joseph Adam. NRS 905 64/5088.